It’s time for another dive into the world of captive Killer Whales! This time, we’re heading back to Loro Parque and taking a look at one of the male orcas who currently resides there. His name is Tekoa and he is currently 15 years old. Tekoa is one of the killer whales who was transferred to Loro Parque to begin the Orca Ocean show. He was born at SeaWorld Orlando on November 8th, 2000 and is the son of Tilikum and Taima. He was the second calf of Taima, but Taima proved to be quite an aggressive mother to both her calves. This meant that Tekoa was separated from his mother at a very young age with the view to protect him from her aggression. It was because of this that Tuar’s mother Kalina took over the role of mother. Kalina was present at Tekoa’s birth, and having her own calf to raise who was nearly a year old, she took Tekoa along, too. As I mentioned in Tuar’s post, both he and Tekoa got along very closely. Tekoa moved to the San Antonio park with his half brother Tuar in April 2004, but was moved to Loro Parque and away from his close friend in the February of 2006. Loro Parque’s new video detailing Tekoa’s life at the park. Tekoa has remained at the Tenerife park ever since; joined by other whales from the SeaWorld collection – many of whom he shares bloodlines with. He has been involved in one notable incident which ended with a trainer being hospitalised after interacting with him. After failing to pull off a successful foot push in the water with Tekoa, trainer Claudia Volhardt found herself being pulled to the bottom of the tank by a frustrated whale, who was no doubt angry that he wasn’t being bridged or rewarded for his actions. Tekoa then proceeded to bash his trainer against a gate which separated the main show pool from the back pools. Even though the trainer was retrieved from Tekoa’s grasp, he reportedly continued to try and reach his trainer while she was recovering. He had broken her arm. After this behaviour, restrictions were placed on Tekoa and there were special requirements that needed to be met when doing work with him. Tekoa is also known as one of the most raked orca in captive history. If you take a close look at his skin, you’ll see hundreds of grooves carved into his skin where other orcas have used their teeth to put him in his place. As a submissive orca, Tekoa seems to be covered in full body rakes – it’s sadly what helps identify him. Both his eyepatches are pretty long and oval looking, with his right eyepatch fading at the end gradually. 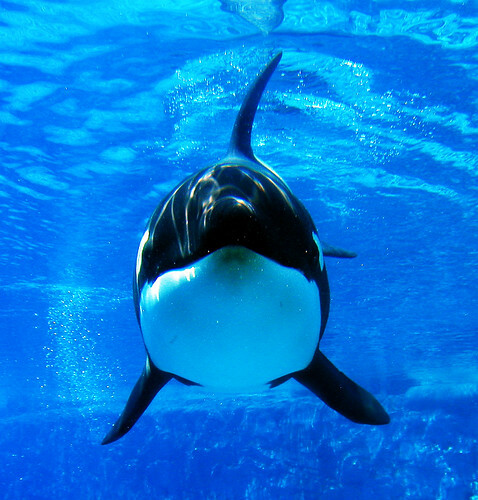 His dorsal fin leans to the left, and his face is very similar in structure and look to that of his father, Tilikum. He is 5 and a half feet long. His name apparently means “Beautiful” in Cherokee and ask Taima’s father was Kanduke, he is also 25% Transient. Despite all his rakes and his not so clear history with trainer aggression, this doesn’t mean that Tekoa is a bad whale – he just needs to have an opportunity to live a near normal orca life!